"The year is 1972, but it's not the 1972 we know and love. 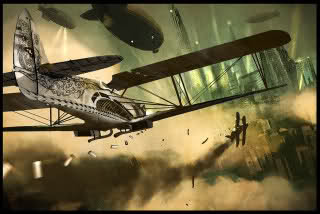 Airships rule the skies, fashion has traveled back in time, and a new breed of pirates has arisen. Add to that secret societies, witches with higher mind powers and creatures of the night and you have the world of the Shadow Cast." So, we can choose what scenario based on some suggestions James has made, but this is the basic premise. I actually have a whole Wiki if you have questions. But yes! This is going to be fun! So all the roleplays started here will be based in that universe? Or can we start our own? yup, no problem. I'll open up another section for not Shadow Cast stuff! Play whatever you want!